That’s right, Facebook appears to be running a test which would see the ‘Share’ button removed from News Feed posts, replaced with a ‘Message’ button instead. The new format would likely see a reduction in public post sharing, further shrinking already low organic reach numbers. And while the option does move in line with broader trends shifting towards private messaging, the impacts could be significant – if, in fact, Facebook does go ahead with a broader push. On that front, we don’t have a lot to go on as yet. But as noted, it does make some sense. That trend can be traced back to the rise of Snapchat – while, initially, the concept of being able to share everything publicly on social media was exciting, providing anyone with a platform from which to share their views, as the medium has evolved we’ve also become increasingly aware of the dangers and potential negatives of public sharing. This is most notable in regards to publicly recorded perspectives being used against us. We saw a high profile example of this recently in Sarah Jeong, a writer at The Verge who’s been appointed to a role at The New York Times. Upon the announcement, some of Jeong’s old tweets, which expressed controversial views, were uncovered as part of a campaign to discredit the NYT and Jeong herself. That element appears to have pushed people towards more private sharing – on the back of this, Snapchat essentially rose to prominence as the anti-Facebook, with a focus on private, disappearing messages that couldn’t be pinned to your public record. 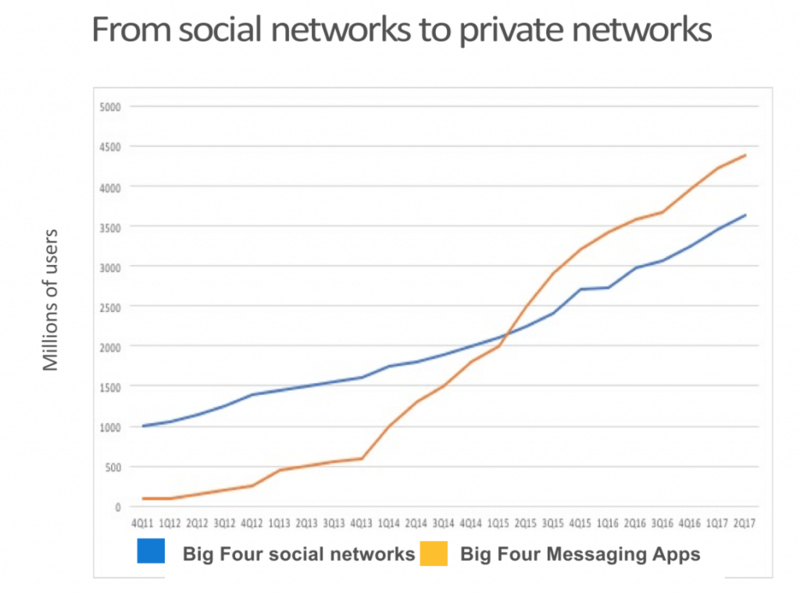 Since then, messaging apps have continued to rise, and the latest Facebook data scandals look set to amplify this even further, pushing more and more engagement across to messages and enclosed groups. Given the broader trends at play, switching the emphasis on public sharing of Facebook posts to private messaging is logical – and Facebook’s data must show that more users are indeed sharing content via message, as opposed to sharing them publicly. Without that option, or with it essentially de-emphasized, you’ll be more reliant on organic reach, and while you may see some of that replaced by increases in sharing via message, given that that type of sharing is not public, you would have to think that it won’t help you get your messaging in front of as big an audience. But then again, maybe it will – maybe the data shows that more people are sharing via message anyway, and by making it a bigger focus, it could actually prompt more users to distribute and discuss your content, even though it’s in a more private forum. It seems unlikely, but only Facebook has the actual data, and we won’t be able to measure it for ourselves unless it gets implemented. Again, we have no word if or when that could happen, and whether this is even a full-scale test that Facebook’s pushing. But it’s one to watch either way.